We will, again, offer a fan bus for the championship game being played at Middleton HS, Saturday at 1pm. Per person fee will be only $10 per person. Bus would leave SRHS at 9am Saturday, and return following the game (arriving approx. 8pm). Adults and students are welcome to take the bus, with Middle School students required to have an adult with them on the bus. The deadline to signup for the bus is Wednesday at 4:00. Call Sherri Cereghino at Salmon River High 630-6025 to reserve your seat! All Stars, Veteran’s, and Fans! Congratulations to Maddy Tucker and Sarah Laritz! They are playing in the District 3 Senior All Star game today in Parma. The Veteran’s assembly on Thursday has been changed to 9:00 a.m. Then there will be a pep assembly at approximately 10:00 a.m. The football team bus will leave immediately afterwards. We organizing a fan bus for the semifinal football game in Pocatello on Friday. The bus will leave and return on Friday. Times are yet to be determined. The cost is $20 per person. We need 25 people to sign up by 4:00 p.m. on Wednesday. If you would like to go, please contact Sherri Cereghino at 630-6025, ext. 5101. College Application Week and Testing Coming Soon! Monday 10/31 The GOAL= All seniors have applied to at least one college. We need this for the College Application Week requirement. Thursday 11/3 Jesse Webb Head Project Engineer for the Manning Bridge and Mathew Fletcher Project Engineer for the Goose Lake Project; will be here to talk about the field of engineering. Mathew is also a recruiter for his company. These presentations are open to all grades 9-12…with teacher approval unless Brandon wants to limit the number of students. It would help to get a prior count of interested students before the presentation. We can always use the IEN room. Please let me know if you have 4th hour students interested in attending. Amis-Web Plus Benchmark testing for Middle School will start next week 11/2. The test are not timed and the suggested time frame is 40-50 minutes per test (math & Reading). Testing Schedule Middle School will start next week 11/2. Most of the high school students will probably finish in less time than the suggested 40-50 minutes. I hope they can complete both tests in one period. 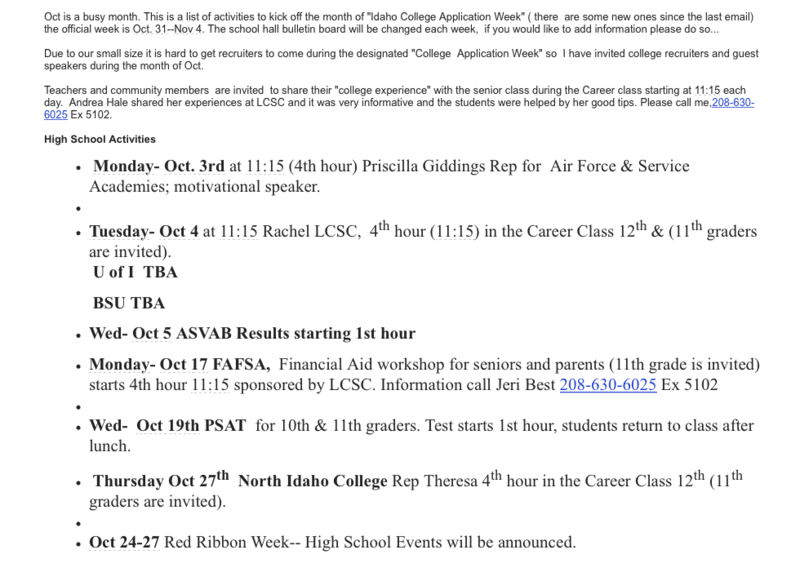 Due to our small size it is hard to get recruiters to come during the designated “College Application Week” so I have invited college recruiters and guest speakers during the month of Oct.
Monday- Oct. 3rd at 11:15 (4th hour) Priscilla Giddings Rep for Air Force & Service Academies; motivational speaker. Tuesday- Oct 4 at 11:15 Rachel LCSC, 4th hour (11:15) in the Career Class 12th & (11th graders are invited). Wed- Oct 19th PSAT for 10th & 11th graders. Test starts 1st hour, students return to class after lunch. 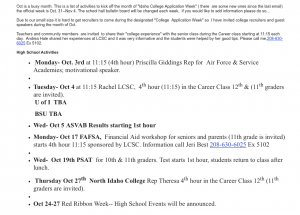 Thursday Oct 27th North Idaho College Rep Theresa 4th hour in the Career Class 12th (11th graders are invited). Oct 24-27 Red Ribbon Week– High School Events will be announced. Nov 8 Joy Miller, Head of the Idaho State Scholarship Program will be here at 11:30 to speak to students. This is for all interested students in the IEN room. (9th, 10th, 11th, 12th). I will keep this updated as events are added or changed. There is a new school day start time at the jr/sr high school. The first bell will be at 7:56. The bell schedule hasn’t been finalized yet, but I want everyone to know (especially those parents that drive the kids in) that school will start earlier. There should be no change in bus pick up times in the mornings. No change in release time, still 4:00. Supply lists for junior and senior high will be posted here as they come in. All science students need a college ruled note book and a binder just for science class. Parents – there will be NO charging lunches beginning May 24th. Please put enough money in their account to get them through the end of the school year. Any extra money left in the account will be carried over to next year. Today is Savage Pride Day! · We will have a combined lunch at 12:09 with: Hamburgers, hot dogs, potato salad, chips, watermelon, cookies, and milk. · Students will report to 5th hour at 1:00 p.m. for attendance then be released to the multi-purpose room for yearbook signing and games. · There will be a pep assembly at 2:10 p.m. for the track team with a sendoff at 2:30 p.m.
All 2016/17 IDLA class registration forms must be turned in to Mrs. Barany by Monday, May 23rd. All library books must be returned by Thursday, May 26th. Anyone 16 years of age and older – if you are interested in a summer job with the school, please contact Mr. Doramus at 630-6025 ext. 4117. There are still 6 junior high basketball photos in the office. Cost is $10.00. June 2 – Last day of school, Early release at 2:00 p.m. The junior high basketball photos have arrived. They are in the office and cost is $10.00. Student Body Office petitions are available in the office. They are due May 12. Elections will be held on May 19. Our high school track meet team will not be going to the meet in New Plymouth scheduled on May 5. Instead the high school track team will be traveling to the Vandal Invitational meet in McCall tomorrow. The meet starts at 4:00 p.m. Bus leaves at 2:30 p.m. The junior high school track team will be traveling to the McCall meet on Friday. The meet starts at 12:00 p.m. Bus leaves at 10:30 a.m. The high school track team will be traveling to the Long Pin Championship meet on Saturday. The field events start at 10:00 a.m. and the running events start at 12:00 p.m. Bus leaves at 7:00 a.m.
We develop the individual strengths, talents, and academic excellence for all students in well-disciplined classrooms. We instruct all individuals according to ability and need by using current technology, traditional methods, and proven practices utilizing challenging coursework in the basic curriculum. We respect all members of the learning community, which guides our interactions between school, home, and our community and encourages a supportive, positive, and safe learning environment. We place emphasis on developing effective, productive community members by practicing basic values and life-long skills like citizenship, responsibility, communication, workforce skills, and goal setting. Lunch: Chicken tacos, chipotle black beans, Mexican rice, mandarin oranges, salsa, sour cream, and milk. Students please claim your items from the lost and found. Since the box is overflowing, all items will be taken to the Etc. store on January 15. The girls basketball team will be hosting Council tomorrow with game beginning at 6:00 p.m. The Future City competition will be this Thursday at 9:15 a.m. in the multipurpose room. The winners will then advance on to Boise on January 23. The basketball teams will be hosting Tri-Valley on Friday with games beginning at 4:30 p.m. The basketball teams will be traveling to Council on Saturday with games beginning at 4:30 p.m. Bus leaves at 2:30 p.m.
No school on Monday, January 18, due to Martin Luther King Day. Please note the additional games and time changes for the games on January 19. The PSAT for 8th and 9th graders will be on January 20. Parents/Students – please pay your basketball fees as soon as possible. Jan. 25 – School Board meeting, 6:00 p.m.
Feb. 22 – School Board meeting, 6:00 p.m.